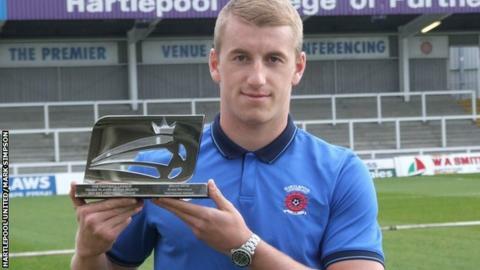 The sign on the stand behind Scott Harrison as he poses with his Football League Young Player of the Month award reads 'Hartlepool College of Further Education', but in the case of the 21-year-old defender, he could be described as a graduate of the 'School of Hard Knocks'. Harrison made his first-team debut for Darlington at 16 in the chaos of the club's financial implosion, alongside senior pros struggling to pay the mortgage after months without salary. He bounced back from his release by the Quakers to join Sunderland, but had to prove himself to incoming manager Ronnie Moore before earning a deal at current club Hartlepool United. Now 21, Harrison has since more than proved his worth to Moore and Pools, starring in their late season 'Great Escape' bid to win the monthly award, and is desperate to secure their Football League status with three games remaining. Pools currently sit a point above the relegation places in League Two after Tuesday's 1-1 draw with Accrington, having spent five months rooted to the foot of the table between October and March. "I'd give our Nanna for safety," the defender joked to BBC Sport. "Scott knows what football is about, there's an awful lot of players at under-21 and academy level who haven't got a clue," says Hartlepool United boss Ronnie Moore. "The last month we've had has been unbelievable, we're out the bottom two now, and the last couple of games have played well but haven't scored the goals. "You can see there's more confidence in the team and it's shown in the results. The fans are class, the lads, everything about the club here is brilliant, that's why we've got to stay in the league really." Having missed out on the monthly senior Player of the Month award, Harrison was selected for the Young Player award ahead of eligible players throughout the three divisions such as Middlesbrough's Patrick Bamford. "Winning awards makes you proud of what you're doing, it's good to be recognised if you're playing well, but I've never really won awards before - the last time I did was playing for my Sunday League team," he said. "It's massive for me really, my family and friends are proud. It's great to win ahead of players across the Football League who have played unbelievably." The Middlesbrough-born centre-half's positive outlook and youthful bounce has been unaffected by the ups and downs of his career so far. Instead they have grounded him and made him appreciate the opportunity presented by a career in professional football. "When the money issues started at Darlington, some of the lads weren't getting paid," Harrison continued. "I was in the youth team so I was still getting paid by the Football League but for those lads - you felt for them because they looked down and there was nothing they could do about it. "We had to bring packed lunch to training, you'd take your kit home and wash it, the only kit washed for us was the actual matchday strip and we had to get a minibus to games, which was a bit tight with everyone's bags on. "In training, we had the balls, goals and the cones, it was like being in a Sunday league team." Off-field hardships were balanced by the thrill of first-team football, and learning the art of centre-half play at senior level. "I made my full debut against Forest Green Rovers and they only had a small striker so that wasn't so bad," he added. "Then I played against Mansfield, and they had a big striker and I got a few bust lips. "I looked forward to playing against the big lads and getting smashed about." Such battle-hardened experience has proved essential to Moore, who has struggled with the club's position to draft in the right faces on occasion this term. "He knows what football is about, there's an awful lot of players at under-21 and academy level who haven't got a clue what football is about but he's been there and seen it," Moore said. "He's got pace, normally at this level they're big and strong, and I think he's good enough if he keeps learning the role, takes on board what Sam (Collins) and myself are teaching him he can play top level. "Hopefully the bigger fish will come for him in the none-too-distant future."